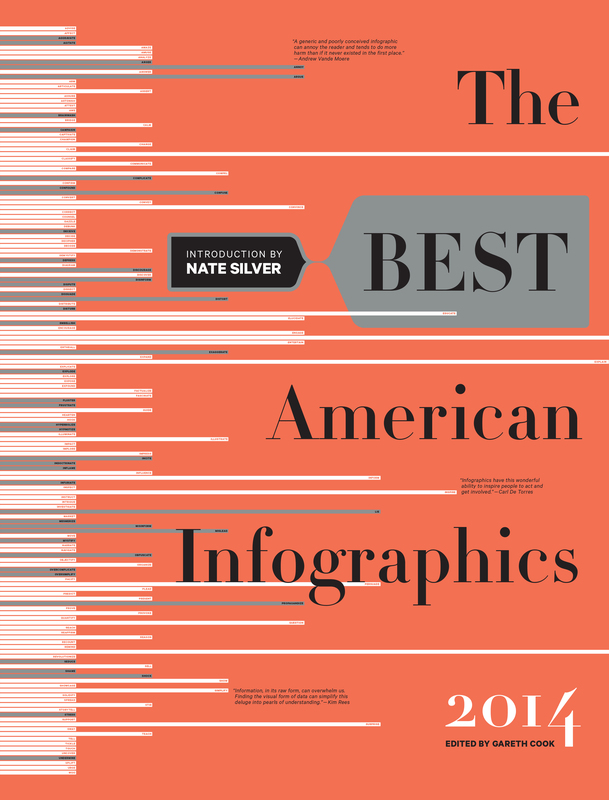 A few days ago I received an advance copy of The Best American Infographics, 2014, the latest installment of the series introduced last year by the publishers of the popular “Best American…” series (with long-established titles like “Best American Short Stories” and “Best American Nature and Science Writing”). Based on their focus on writing, it was surprising and commendable that publishers Mariner and the series editor, Gareth Cook, have decided to shift their attention to infographics. Once again, this year I was part of the “Brain Trust” charged with selecting some of the best infographics published in North America during the previous year. Other Brain Trust members include Alberto Cairo, Jen Christiansen, Amanda Cox, John Grimwade, Nigel Holmes, Maria Popova, Simon Rogers, Nathan Yau and others. This year’s book is introduced by Nate Silver, the ex-New York Times statistician and author of The Signal and the Noise, and founder of ESPN’s FiveThirtyEight.com. The book is divided in 4 somewhat arbitrary groups called You, US, Material Word, and Interactives. I wouldn’t say all the awarded (published) graphics deserve to be there, or that there are not very notable omissions, but overall it’s a good and representative sample that infographics aficionados will enjoy. If anything, the selection feels a bit short. Perceptive readers will be watchful enough to look elsewhere for a more complete sampling of the current state of infographics, since there is a lot of amazing work being done out of North America. 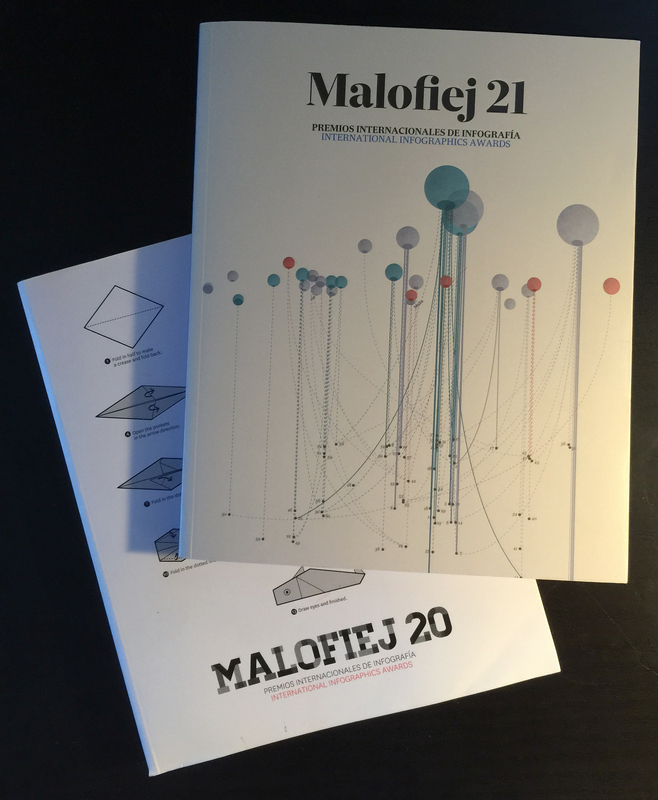 The most complete representation of each year’s best infographics at a global level is still the annual volume published by the Malofiej conference with the winners of the previous year’s competition (and the added bonus of really good articles). 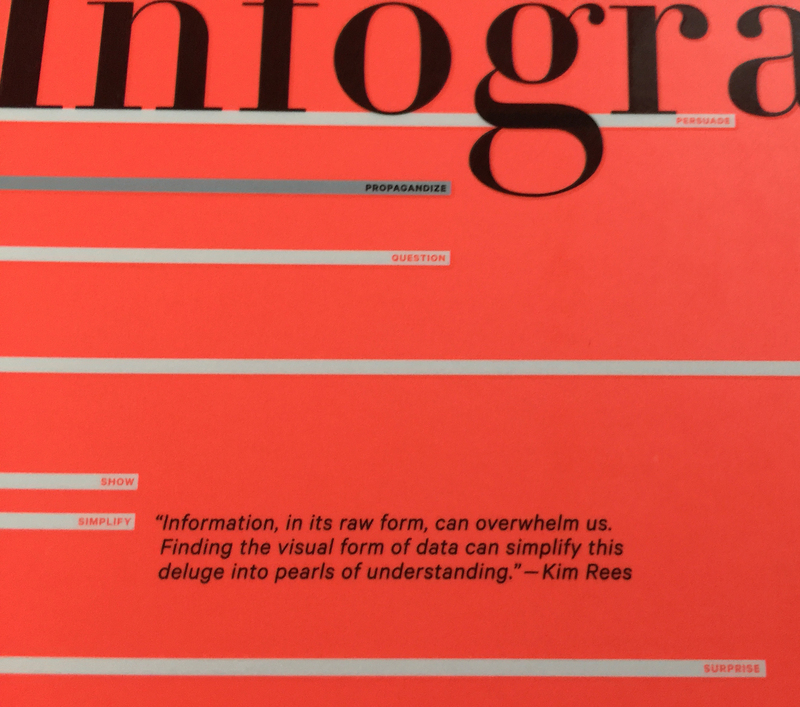 The Best American Infographics includes a hefty contribution from National Geographic, jobs I was involved in as Art Director of the magazine (for the most part this means I was lucky enough to work with the brilliant people that actually created them). 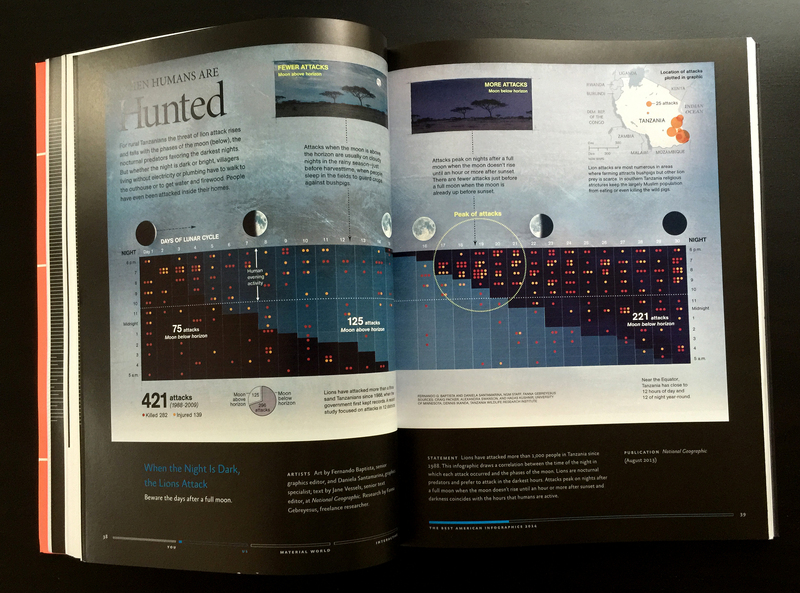 One of my favorites is “Hunted”, a fabulous example of data visualization by Fernando Baptista. Very rarely you see Fernando working on charts and non-illustrated, data-driven graphics, but this example really shone. Fernando documented more than 400 lion attacks to humans in Tanzania since 1988 (with over 1,000 injured or killed). The infographic draws a correlation between the time of the night in which each attach occurred and phases of the moon. Lions are nocturnal predators and prefer to attack in the darkest hours. Attacks peak on nights after a full moon when the moon doesn’t rise until an hour or more after sunset and darkness coincides with the hours when hum as are still active. The textured background and hand touches gives it a unique look. Daniela Santamariña, Jane Vessels and Fanna Gebreyesus also contributed. 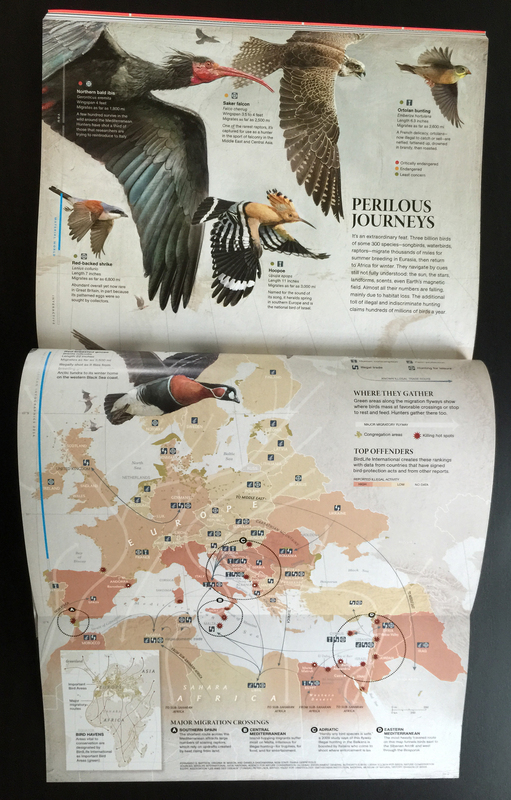 Fernando and Ginny Mason worked together on their stunning poster “Perilous Journeys” (also in the book) on migratory bird species threatened by hunters in European countries as they arrive from Africa. The editor chose to publish 5W Infographics’ “Cosmic Journeys”, even though I warned him the graphic had been published before. But it was a refreshed version. For a recent reprint in National Geographic I decided to reorganized the text of the graphic completely (leaving the visuals untouched except for data updates). Now text flows in a more logical (and better aligned) sequence. 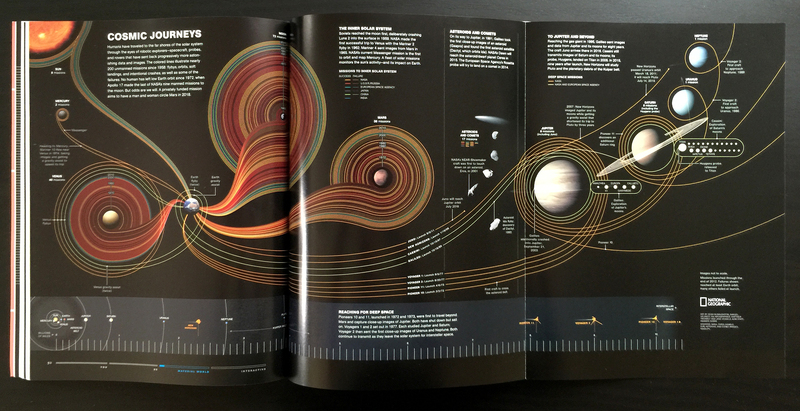 The graphic shows every single space mission to the Solar System and beyond since the beginning of the Space Race. Color coding of the lines indicates which country sent the mission out (Click on the image to enlarge it). The book’s cover was designed by Carl De Torres and works as an infographic by itself. Carl asked the Brain Trust members to provide words to complete the sentence, “infographics have the power to…”, and plotted the results with elegant bars. The book ends with the so-called top ten American interactive graphics of 2013. you can see all the winners here. At less than $15 in Amazon, The Best American Infographics is a great bargain. This entry was posted in Graphics, Uncategorized and tagged books, infographics, review by 5wgraphicsblog. Bookmark the permalink.